Watching a puppy grow from being a tiny fluff ball into an active, curious and sprightly creature can be a satisfying and exciting thing. Newborn puppies develop and grow so quickly that, if you blink, you really may miss something. After week 1, healthy puppies usually literally double in size. 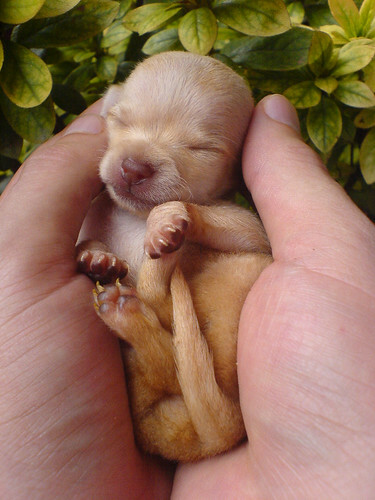 Newborn puppies vary greatly in birth weight, and breed has a lot to do with it, notes the ASPCA. After all, a German shepherd puppy is unlikely ever to weigh the same as a Maltese puppy at birth. Certain dog breeds are larger than other ones, plain and simple. No one set "standard" for how much a newborn puppy may weigh is in place. Apart from breed type alone, all puppies are separate individuals, too. During the first week of a puppy's life, her weight should double itself, ideally. If a puppy first entered the world weighing in at 10 ounces, then she probably should tip the scale at 20 ounces after the initial seven or eight days or so. If a puppy is putting on weight steadily and consistently every day, it's usually a sign that things are going rather swimmingly in the development department. Daily weight gain is important in the first few days and weeks of a puppy's existence. As for what exactly to expect when you weigh your wee fluff ball, the ASPCA indicates that puppies often tack on anywhere between 10 and 15 percent of their newborn weight with each passing day. If a puppy is accomplishing that, then she may be the picture of glowing health. Lack of weight gain actually may be a sign that something is amiss, so notify your veterinarian if your puppy's growth seems to be slow or nonexistent. A kitchen scale may be a handy tool for keeping track of your pooch's weight. During the first week of a puppy's life, he should be receiving 100 percent of his nourishment thanks to mama's nursing. Nursing is the full deal for a newborn puppy. The milk that he receives from his mama dog can provide it all for him nutritionally, from immunity boosting antibodies and fats to minerals and proteins. If, however, a puppy is separated from mama or she otherwise is unable to care for his sustenance needs, commercial puppy milk replacer and puppy formula can work fine, too. Proper nutrition is key to promoting consistent and regular weight gain in newborn puppies. If you are at all uncertain on how to go about feeding a puppy, consult your veterinarian.